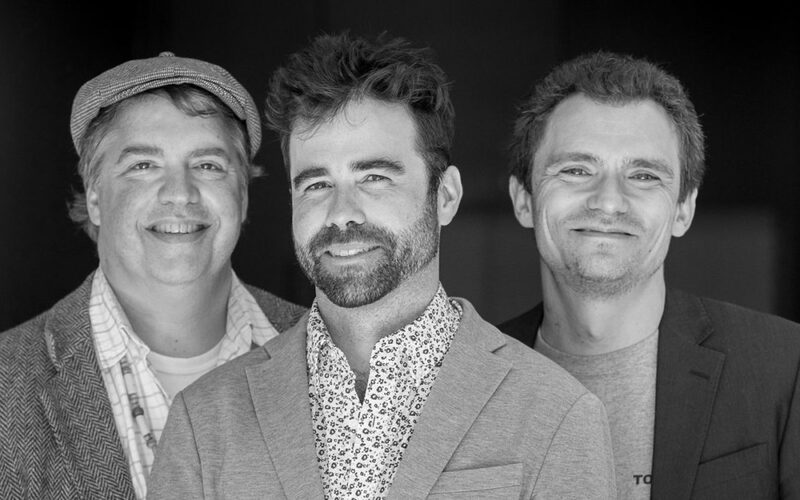 “Duende Libre” translates roughly as “free spirit,” and the dynamic Seattle trio’s music expresses that notion well. But the band explores realms beyond mere freedom: faith in community, positivity, and the core belief that art is a medium for human connection in a fragmented world. Comprised of founder and bandleader Alex Chadsey on keyboards, Farko Dosumov on bass, and Busch, Duende Libre crafts an intoxicating musical blend that winds through Africa, Cuba, Brazil, and beyond. But this is no mere musical tourist grab bag of genres engineered to demonstrate versatility. Their music is a thoroughly organic blend of groove and vibe, forged through careful study and dexterous versatility, as well as the earnest belief in the transformative power of music. On June 16, the trio will release their second album, Drift. Balancing lushly complex harmony and rhythm with melodic accessibility, and drawing from the well of jazz-based but globally minded musicians such as Chick Corea, the album is a sublime tour de force and step forward for the band. Chadsey is the primary composer, but the final creations are truly the collaborative work of all three, and they have developed an effective working method to content with the flood of ideas they produce. The new album is a riveting listen, but where Duende Libre really create their deepest magic is onstage in front of an audience. The band is prepping for an upcoming CD release event on June 29, which will also feature powerhouse vocalist collaborators Chava Mirel and Frank Anderson. To see the band live is to get a sense of the deep respect they have for each other, and the joy they take in connecting with each other and the audience. The good vibes are for real, and they inoculate the three against the travails of creating art in a high-tech world, where music can become just another product data point, and it can be hard to make a living. “It’s important to have the balance between having this hard-nosed realism about the situation, but not letting that ultimately kill your desire, or need, to create,” continues Chadsey. Duende Libre is aural balm for the soul, medicine that goes down easy, and will leave you healed in both body and spirit. Daily use is recommended.